Foster Kittens Want OUT of Their Cage! Thimble and Pepper are two superstar tennis players. Except they're not your normal tennis players... They are cats! Cats, to be more specific, who have a daddy who is very creative and very silly to think of setting up this "tennis" game for them. And I love it! When I realized exactly how they played tennis, I honestly giggled out loud. What do you think? BONUS CUTE: Here's a parakeet playing on a tennis ball. Get more silly cute cat videos! Why not subscribe to Your Daily Cute by email? At only six days old, this wobbly little baby lamb is already making friends... with a big, soft-hearted doggie named Misky! Misky always seems to immediately take to baby animals, and this little lamb is no exception. They sniff a little, kiss a little, and eventually lie down and just relax together. So sweet! BONUS CUTE: Here's the same baby lamb bouncing in the living room a couple weeks later! P.S. Today is my mom's birthday! Cute! Cute! Cute! Why not subscribe to Your Daily Cute by email? Get all the Cute! Do all kittens do this silly surprised spread-paws thing when they're on their backs and you tickle their bellies? I think they do! And you know what? I never gets old. Just like kittens looking in mirrors, these surprised kitten videos are guaranteed cute every single time! NOTE FROM CUTE: Guess what? Last week I posted a few black kitties and some other less-adoptable cats on the Cute's Facebook page and a miracle happened -- a fellow Cutehead, Leigh G., decided she wanted to make some of them part of her family! We are working on saving three cats from animal control (an icky kill shelter) and she is adopting another one from a great place called Noah's Ark Rescue near me. I'll keep everyone posted... We'll need to drive them all the way through Florida and sometime in the next week or so! Penny and Terry are some lucky kittens -- they got rescued and are off to live with a wonderful foster mommy until they get adopted! There's just one thing... They are really, really, really impatient and they want to get out of their cage. Right. Now. It makes sense that they're so excited. They're foster mom is Cute's really good friend, Tamar, from I Have Cat! (Remember we went to Key West together a few months ago to visit the Hemingway cats?) I'm sure they'll be raised purrfectly! P.S. If you're interested in adopting Penny (the black one) or Terry (who has extra toes! ), you can email adoptions@citycritters.org. Love kittens? Why not subscribe to Your Daily Cute by email? Don't miss a Cute! 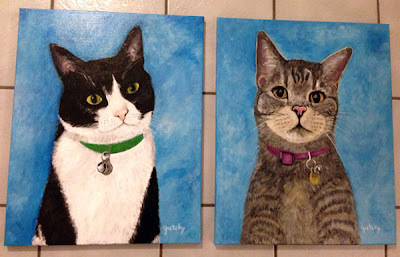 Two Cats Tuesday: We Got Custom Portraits of Pimp and Moo! Happy Two Cats Tuesday, Cuteheads! I got custom portraits of Pimp and Moo and I cant' wait to share them with you! 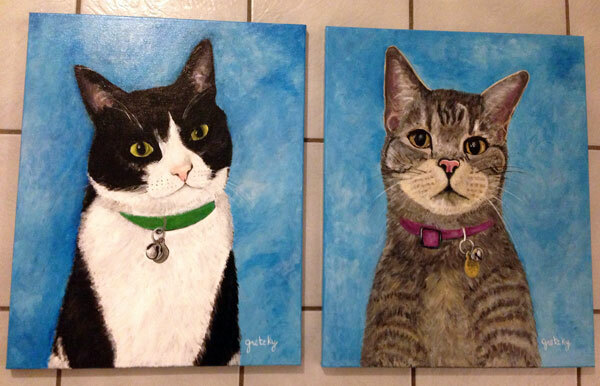 A couple months ago, a lovely artist and friend of Cute named Gretzky reached out and offered to paint Pimp and Moo for me! She does custom pet portraits (and a bunch of other things as well, but we're biased toward pets here, of course!). Moo and Pimp... in paint! What do you think? Are those not gorgeous paintings? Look at Moo's face -- it's perfect. His expression is dead-on! And check out Pimp's heart-shaped pink nose. Just like the real thing! Seriously, though, let's look at Moo's portrait closer. I love them both, believe me, but this one of Moo is just stunning. He is such a goofball and she managed to capture him just right. His eyes are playful, his head is tilted -- it's exactly him! I couldn't be happier. I just need to find the perfect place on the walls for them. I want to make sure they get a place where we can show them off! 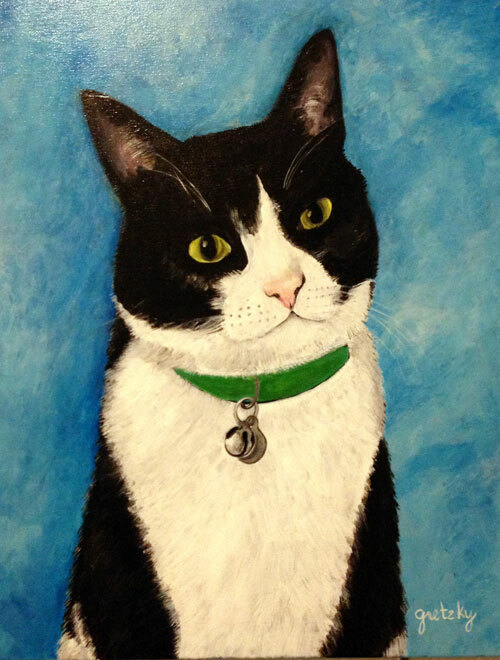 If you want to know more about her custom pet portraits and other stuff, check out her site, paintingsbygretzky.com or like her on Paintings by Gretzky on Facebook. Her cats and her dogs also have Facebook pages where she holds contests and things. And... some more fun: She put Pimp and Moo on some products to sell. (Just to be clear: I don't get any money from the sale of these and I'm not getting any money to talk about her here -- just the paintings.) I think my favorite is the Pimp and Moo Mug, but the Moo the Cat hat is also particularly silly! Also, if you're interested, you can get pricing for her custom pet portraits here. So what do you think? Are the boys good art subjects? Owlbert the cute owl is an attention hog. He loves to be petted and makes the cutest little squeaky noises while his chin and cheek are getting skritches. It really is like he thinks he's a cat. When his squeaks get good and rolling, it's almost like he's purring! BONUS CUTE: Here's a barn owl that purrs and loves to be petted, too! Don't get any crazy ideas about trying to pet this cat or show him any love right now. He is NOT in the mood. At all. Go ahead, try it if you want... and feel the power of the paw! I'm telling you, he has a mean right jab. More cute! More cute! Like Your Daily Cute on Facebook and get tons of bonus cuteness. Promise.